The infinite variety of Italian culture and life is dramatically on display in several programs this season. Ever wanted to live like an Italian duke? Perillo Tours can give you a week in the 12th century Montegufoni Castle surrounded by the vineyards and castle topped hills of Tuscany. The seven-night package is priced from $475 per person and besides your own personal castle. Rentals will be available Monday to Saturday from now until May 31. Guests can choose from one-, two- or three-bedroom private apartments with personal bathrooms and kitchenettes; and a suggested itinerary that includes a range of activities such as the Florence Walk and Talk Tour, Wanna Be Italiano Cooking Class, Siena Walking Tour and Chianti with Wine Tasting excursion. If living like a Duke is just too removed from the Tuscan common folk, you can get very close to the countryside on a bicycle or trekking through the vineyards. The Adler-Thermae Spa sits in the center of the Val d’Orcia, a UNESCO Site carved by walking and biking trails through nearby villages and open fields. Each day there is a new itinerary and adventure exploring the small villages and backroads. And after a day of exercise guests bathe in the warm thermal waters, take a massage and dine on regional cuisine with local wines. 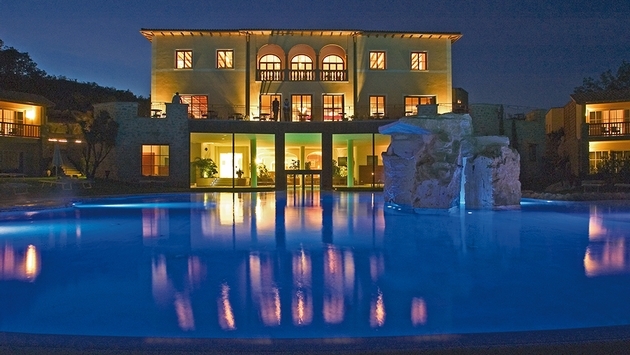 The Adler Thermae offers hundreds of treatments and local excursions. The resort has prepared several packages for bikers and walkers. Three-night packages are priced from 722 Euros ($977) in a superior double room. The Adler-Thermae’s Cycling Special is led by professional guides and follows the finest cycle paths of southern Tuscany. The length and degree of difficulty are chosen in line with the physical fitness and wishes of the group. Central Holidays is offering a very different aspect of Italy, with an Italian version of the Oberammergau that takes place in Sordevolo. The Sordevolo Passion began in the early 1800s. Every five years more than 400 of Sordevolo’s residents transform the ancient city streets into a reconstructed corner of Jerusalem circa 33 A.D. This production pays close attention to every detail, from chariots to Roman armor, and depicts the Passion of the Christ from the moment Jesus entered Jerusalem to the Resurrection. Performed in Italian, it is a major production staged and acted by Sordevolo’s local population; many of the acting roles are passed down from generation to generation. Central is the exclusive ticket distributor for the 2015 Passion Play which will take place from June through September 2015. Group tour packages that include tickets to the production are available now. From Sordevolo it’s easy to combine the play with vacations to larger cities—such as Rome, Florence, or Venice and Central Holidays has an array of inclusive and diverse travel packages that can be seamlessly. Currently tickets are on sale for group travel only; individual travel and ticket sales will open to the public in January 2015. Packages can be customized by Central Holidays’ destination specialists to cater to the specific needs of these groups or individuals.